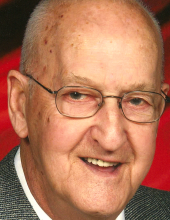 Kenneth L. Dibler, 84 of Lodi, Ohio passed away Thursday, Jan. 24, 2019 at Burbank Parke Care Center. He was born Oct. 9, 1934 in Ruffsdale, PA to Charles and Mary (Seese) Dibler. His family moved to the Cleveland area when he was a teenager, and he began his employment with General Motors. He retired in 1985 after 32 years of service. Kenneth and his late wife Barbara were avid bowlers and participated in league bowling at Strike and Spare Lanes in Lodi for many years. Visitation will be Monday, Jan. 28 from 2:00 – 4:00 PM at Parker Funeral Home, 210 Medina St., Lodi (330-948-1122), where the funeral service will begin immediately following the visitation at 4:00 PM. Pastor Michael LaMar will officiate. Memorial contributions may be made to the American Diabetes Assoc. at www.diabetes.org . "Email Address" would like to share the life celebration of Kenneth L. Dibler. Click on the "link" to go to share a favorite memory or leave a condolence message for the family.